In 1526 (by European measurements), a young Inca boy named Waman has no other wish but to be a fisherman like his grandfather and father and perhaps marry his cousin Tika. Instead, he’s taken from his boat by strange men in an even stranger ship and made prisoner. Forced to learn their language, his name changed to Felipillo, he will be taken to Spain where he’ll survive a smallpox outbreak leaving him scarred physically if not mentally. He’ll return to Peru with his captors, to interpret as they begin an invasion of his home. Thus the invaders are given the name the Gold Eaters. During the years he spends with the Spaniards, Waman witnesses their treachery and brutality as well as the betrayal and murder of the emperor Atawallpa, and rebellion by the emperor’s brothers. He’ll urge his people to resist and assist them in their fight and for that be marked for death by Pizarro. What Waman doesn’t know is that when he was taken to Spain, one of Pizarro’s men was left behind—Molina, who meets Waman’s widowed mother and unknowingly becomes his young friend’s stepfather. 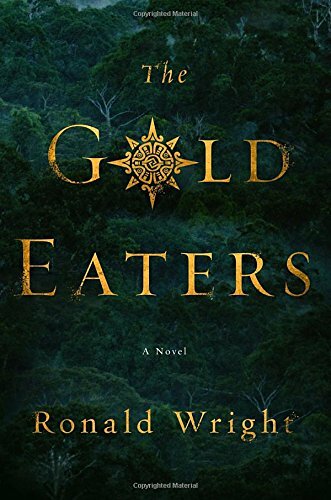 When they meet again, it is with Molina that he attempts to find his family, and escape the Gold Eaters overrunning his country. Anyone having researched this particular era, and learning of the probable fate of the real Felipillo, will be interested in the way author Wright has handled that part of the story. Waman is by turns, frightened, confused, defiant, and cunning in his attitude toward the invaders. He learns how they think and how to speak in ways telling them what they want to hear while warning his people how dangerous they are. Above all, he’s determined to find his mother and his cousin, and again become the simple fisherman and also Tika’s husband, if she’ll have him. This is a well-written historical novel, unique in its point of view, showing the narrative from Waman’s vperspective, as well as the Inca themselves and not that of their conquerors, revealing the petty rivalries and backbiting of the Spaniards as well as the intrigues played out by the emperor’s own family against the background of the conquest of the second largest empire on Earth and the last great civilization in the world. No one reading this book will have a doubt that the invasion of all the Americas was wrong from beginning to end, or that the carrying the message of Christianity to a foreign people was a mere ploy to get a foothold and plunder a prosperous country by so-called civilized Europeans. If there is one fault of this novel, it’s the switching back and forth between past and present tenses, which may have a tendency to confuse. The ending may not be what all would wish, but it’s written in such a way that the reader may complete Waman’s story to his own liking.